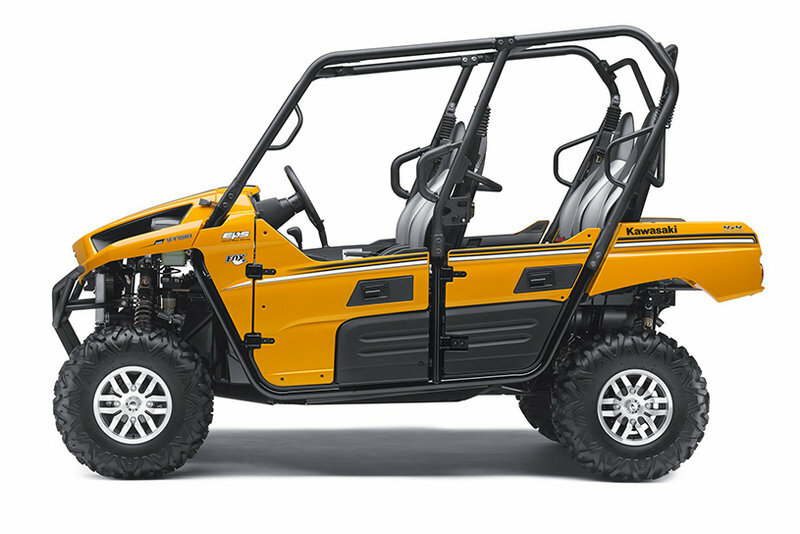 The Kawasaki Teryx4 has been significantly upgraded for 2014. One of the most important modifications is the larger 783cc, liquid-cooled, 90-degree, four-stroke V-Twin engine which is strong but more efficient than the old unit. The engine is fed by a 7.9 gallons fuel tank and is mated to a Continuously Variable Belt-Drive transmission. Another feature offered for the 2014 model year are the new high-performance gas-charged FOX Podium shocks on all-four corners which feature remote resevoirs and adjustable spring preload and compression damping. Like any respectable off roader, the Kawasaki Teryx4 gives you the possibility to select between two-and four-wheel drive using a convenient rotating a switch located on the dash. 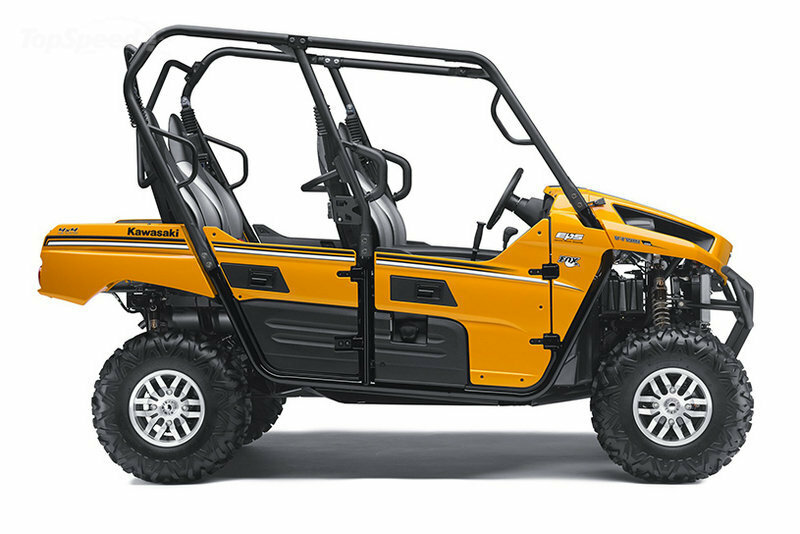 For easy handling the Kawasaki Teryx4 comes with a modern electric power steering (EPS) system reduces steering effort at both high and low speeds. 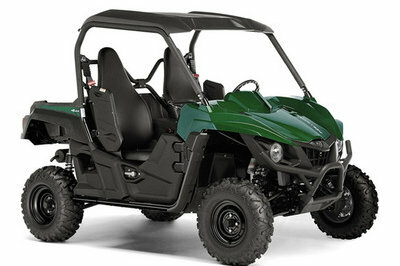 The 2014 Kawasaki Teryx is offered with a base price of $15,799. The Kawasaki Teryx4™ was designed to provide reliable off-road enjoyment for the whole family, but our engineers have never been known to rest on their laurels. 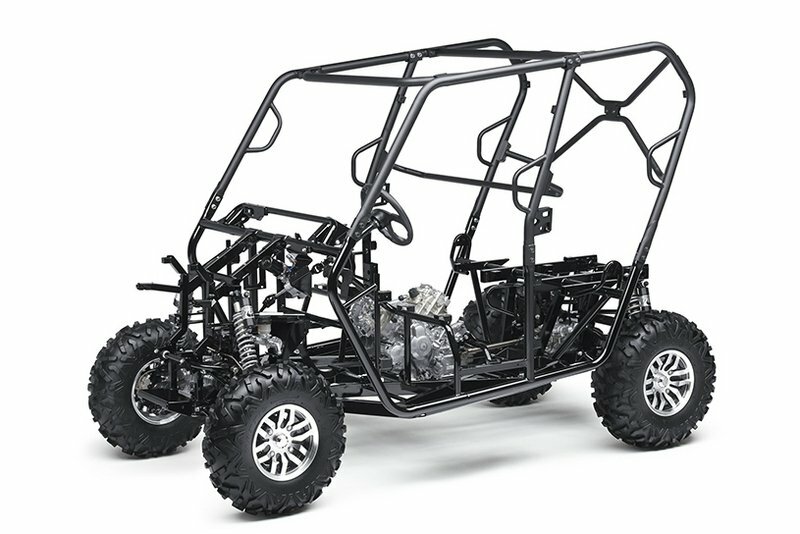 That’s why 2014 sees new benchmarks in performance, power and handling being set by the tough Teryx4 side x side, with significant engine and suspension upgrades that make exploring rugged terrain more fun than ever! A substantial displacement boost means the upgraded V-twin engine now generates 10% more torque and 8% more power for tackling steep hills, negotiating mud bogs and scampering over rocks, all while delivering better fuel economy for even more driving time between fuel stops! 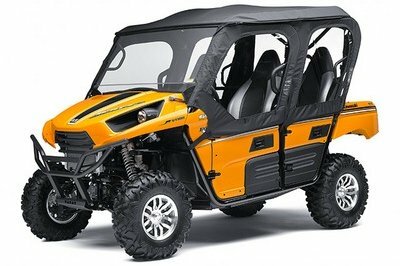 All-new Fox Podium shocks at all four corners give the Teryx4 more trail-taming comfort than ever before, and its cutting-edge Electric Power Steering (EPS) system is proven technology that provides light, low-effort steering for navigating through the most adverse conditions with ease. 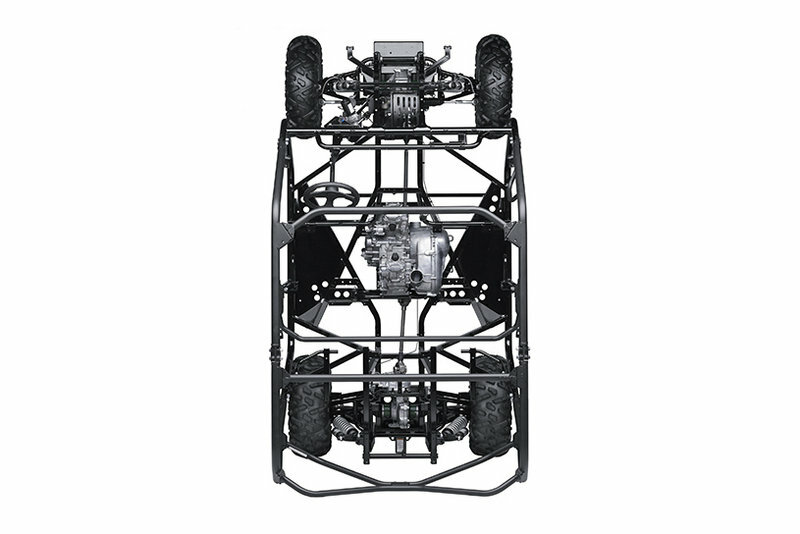 The Teryx4 is designed and built with the strength to handle the rigors of four-door off-roading. Its new larger 783cc V-twin engine delivers serious torque in the low- to mid-range, just where you need it in a four-seat Side x Side, and with improved fuel economy, it’s also more efficient. The 90-degree V-twin design is revered for its stump-pulling power, distinctive sound and easy-to-harness flexibility, making it the perfect powerplant for a machine like the Teryx4. It’s also super smooth, with perfect primary balance that helps keep things comfortable for the driver and the passengers for the entire drive. It delivers instantaneous and controllable low- and mid-range response partnered with eye-opening hauling ability. In fact, Kawasaki’s engineers purposely gave the big V-twin optimum camshaft profiles and revised exhaust headers to deliver exciting power when ridden solo or with a single passenger, but also provide plenty of torque for carrying more people or heavier loads. A Continuously Variable Transmission, centrifugal clutch and a three-mode electronic Hi/Low-Range 4WD system that can be selected by rotating a dash-mounted switch to deliver optimum gearing and traction. 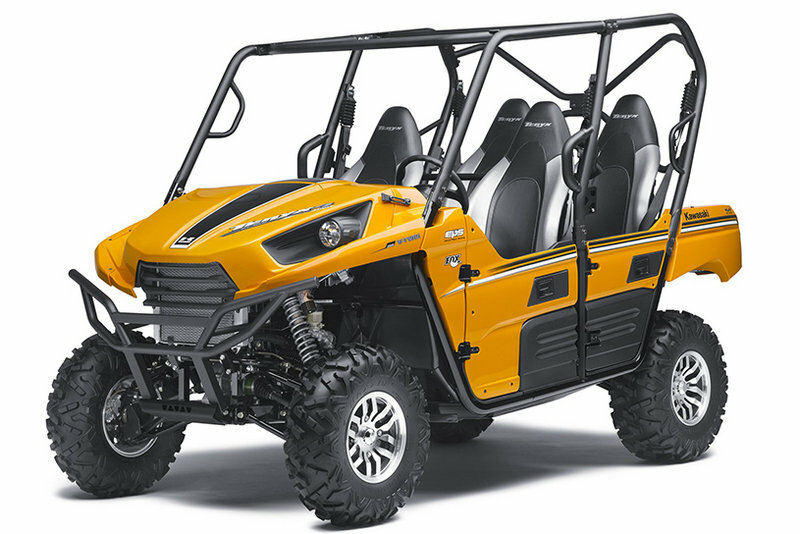 The Teryx4 feeds on technical terrain, thanks to its robust chassis and tight 16.7-foot turning radius, which makes maneuvering in tight quarters a cinch. • NEW Larger 783cc digital fuel-injected 90-degree V-twin offers more power than ever, delivered exactly where a four-seat Side x Side needs it most. Even better... it does it all while delivering better fuel economy! • NEW Larger 783cc SOHC, four-valve-per-cylinder, digital fuel-injected, 90-degree V-twin pumps out 10% more torque over a broad spread of the rev band, plus 8% more power, especially in the low-and mid-range, precisely where a four-seat Side x Side needs it.